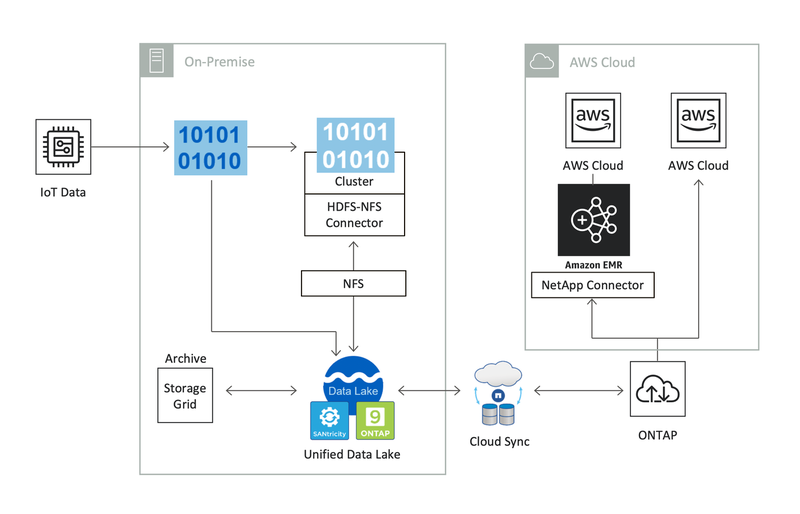 Integrate a business continuity and disaster recovery solution with your AWS infrastructure to backup data from your on-premises and/or cloud environments to AWS storage targets. With near-instant online recovery capabilities that do not require a secondary disaster recovery location, these solutions give you the flexibility and speed you cannot get from tape backup. NetApp® Cloud Volumes ONTAP® provides a scalable, affordable way to protect data and ensure it is recoverable and accessible in case of disaster. You can maintain operation on Amazon Elastic Block Store (EBS) storage and use Amazon Simple Storage Service (S3) storage when you need it. With NetApp Cloud Volumes ONTAP, you can protect your data with fast, efficient SnapShot copies and NetApp-managed storage encryption. Replicate across availability zones or to and from your data center with SnapMirror technology. High availability: highly available storage keeps your applications up and running if the unexpected happens, NetApp® Cloud Volumes ONTAP has a zero-second recovery point objective (RPO). Data replication: Cloud Volumes ONTAP leverages SnapMirror to replicate on-premises data to AWS so it’s easy to have secondary copies available for multiple use cases. Snapshots: Cloud Volumes ONTAP Snapshots create point-in-time backup and recovery points of your data that are less expensive and more efficient than public cloud-based snapshots. Cloud Volumes ONTAP Snapshots can also be moved to S3 to save even further on public cloud storage costs. Multi-protocol support: supports your network file system, common internet file system, and Internet small computer systems interface data in the cloud. Disaster Recovery (DR) is important in journalism to help stay up to date with current events in real-time. Initially, Reach crafted its own DR approach in AWS but found it difficult to achieve the performance and cost savings it sought. After in-depth evaluation, Reach selected NetApp Cloud Volumes ONTAP. With Cloud Volumes ONTAP, the Reach IT team can ensure it would have the same performance and functionality available from the cloud as it does from its on-premises data center. Using NetApp Cloud Volumes ONTAP from AWS Marketplace, we have achieved recovery times in testing that are almost instantaneous, and with as little as 10 minutes of data loss... Overall, we achieved much greater cost savings than we initially expected. In our business, that means more to invest in the great content that keeps customers coming back.